Jacob Bronowski’s “Science and Human Values” was recommended to me by Garry Jacobs, CEO of the World Academy of Art and Science. The book came to mind as he was preparing a conference at CERN in Geneva (November 2015) on proper governance to ensure that science, technology and innovation serve human progress for the benefit current and future generations. Bronowski was a Polish-born mathematician, historian of science, author, poet, inventor and accomplished chess-player who grew up in England. He worked for the UK Ministry of Home Security during World War II to incorporate mathematics into bombing strategies. At the end of the war, he was part of the British scientific team that visited Japan to document the effects of the atomic bombing on Hiroshima and Nagasaki. The barren landscape of Nagasaki that he discovered prompted him to try and convince his colleagues in government and at the United Nations that this desolation should be preserved exactly as it was for future generations to remember the horrors of atomic warfare. In his mind, only “this clinical sea of rubble” would be capable of providing a context for statesman to take decisions with such implications. Regrettably, his colleagues did not agree. The short essays that make up “Science and Human Values” were born in the ruins of Nagasaki in light of the “power of science for good and evil” and the dilemma of civilization faced with its own brutal implications. 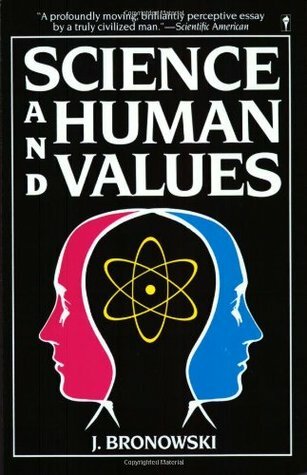 “Science and Human Values” is just as relevant today as when Bronowski was standing in the ruins of Nagasaki or in Auschwitz after the war. A thought-provoking book that I recommend to anyone interested in the future of mankind. The author of this article is an Associate Fellow of the World Academy of Art and Science.